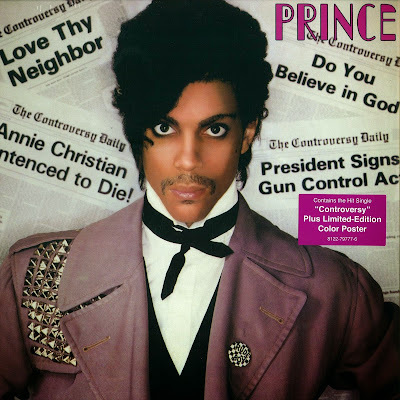 No, not that Prince. I mean MGM's frothy adaptation of 'The Student Prince in Old Heidelberg' (1927), which I'm accompanying on Tuesday, Nov. 25 at the Manchester City Library in downtown Manchester, N.H. 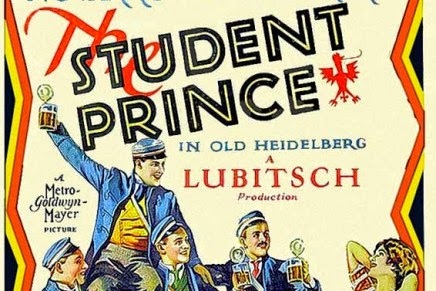 The fun, directed by Ernst Lubitsch, starts at 6 p.m. and the price is right: FREE! So hope to see you there. I must confess that I'm not a great fan of Lubitsch's silent work. To me, it all comes across as fuzzy—the stories, the characters, the focus. But I've never scored 'Student Prince,' so I'm prepared to be proven wrong. We'll see how it does in a theater and with an audience. So yes, I need you there. Also, this weekend sees the return of two silent comedy icons to the big screen: Charlie Chaplin and Buster Keaton. 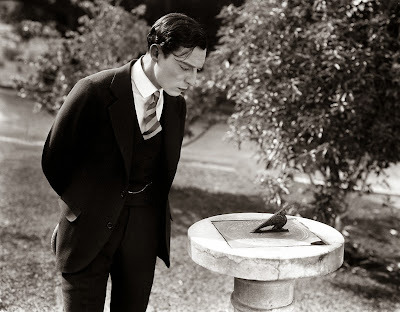 Buster checks the time in 'Seven Chances' (1925). Yes, Sunday's screening starts at 4:30 p.m.
On Saturday, Nov. 29, I'm doing music for an evening of Chaplin short comedies at Red River Theatres in Concord, N.H. The show starts at 7 p.m.; admission is $10 per person. 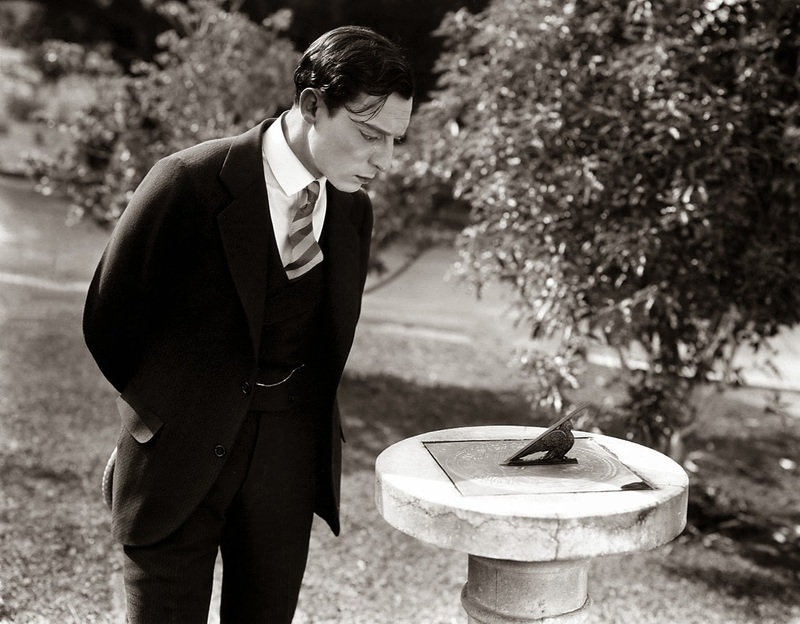 On Sunday, Nov. 30, it's Buster Keaton in 'Seven Chances' (1925) at the Wilton (N.H.) Town Hall Theatre. Starting time is 4:30 p.m. with free admission; a $5 donation per person is suggested. In past years, I've found Thanksgiving is a good time to uncork classic comedies that for many of us formed the "gateway drug" into silent film. By the end of a long holiday weekend filled with turkey, football, and shopping, families are hankering for something different. So taking in a silent film serves as something like a cultural dessert: a cinematic chocolate cream pie. It's a great chance to introduce people to the silent film experience. And if you're an old hand, I hope you'll consider attending, too. Even if you know Chaplin and Keaton's work better than some of your relatives at the Thanksgiving table, there's nothing quite like seeing these films in a theater with live music and with an audience. So come one, come all! This Thanksgiving weekend, see for yourself why people first fell in love with the movies. 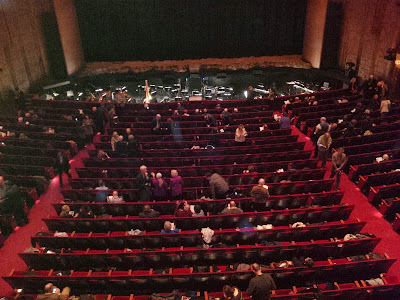 The Met seen from the balcony during intermission at 'The Death of Klinghoffer' on Saturday, Nov. 15. Look at the size of that pit! The cynic in me wants to credit the Metropolitan Opera with ingenious marketing savvy. I was really looking forward to taking in the simulcast of their recent production of 'The Death of Klinghoffer' until the broadcast was cancelled due to controversy. So instead, I hauled myself all the way down to Lincoln Center and paid five times as much to see it in person. Nicely played, Peter Gelb! 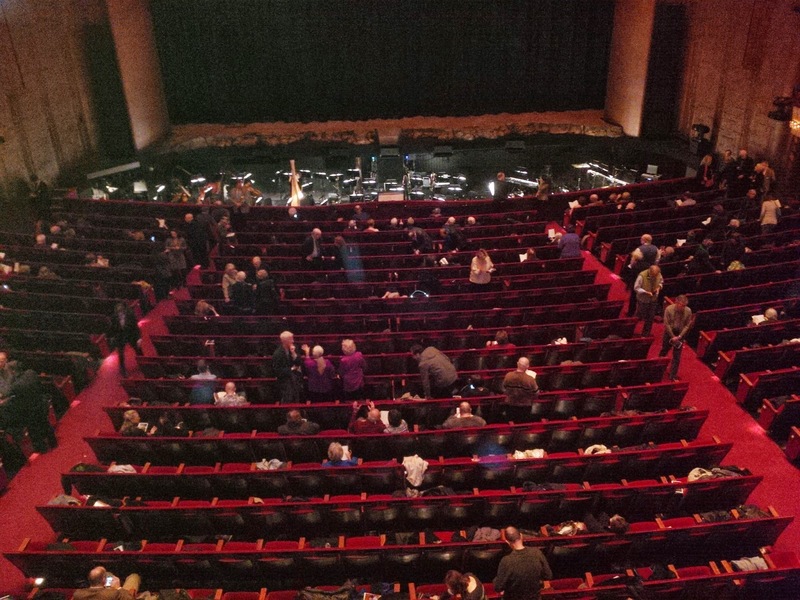 The performance was a matinee on Saturday, Nov. 15, the final one in the Met's 'Klinghoffer' run, and also the one that would have been broadcast. 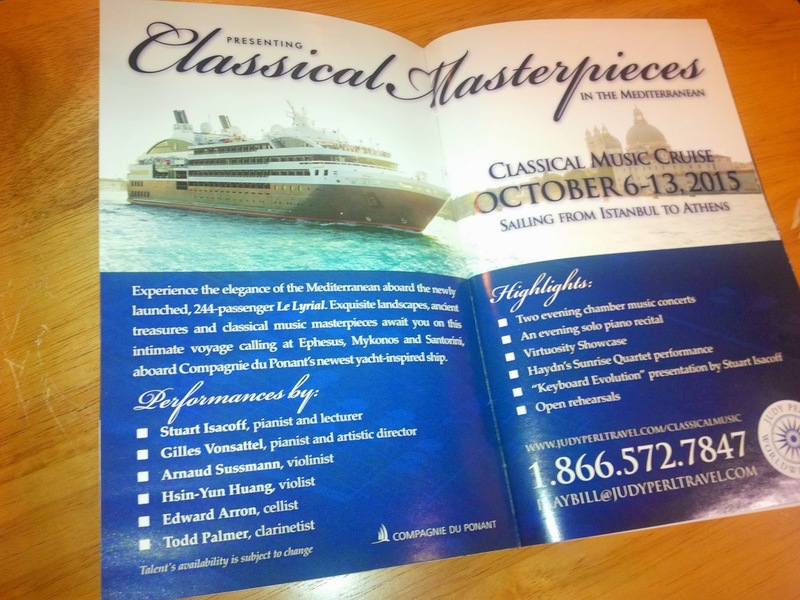 Let's see: an opera about the hijacking of a cruise liner in the Mediterranean Sea in which a wheelchair-bound man is killed and tossed overboard. Is this really the best place to promote this kind of excursion? It's either tremendous guile or tremendous stupidity. Or possibly both. Either way, the mind reels. About the opera: the mind also reels. I find myself completely inarticulate about 'Klinghoffer,' but for the best of reasons, I think. Simply put, I respond to it. It speaks to me in the same way that silent film does: I recognize something in it that reflects the world as I experience it. Also, it gives me hope that there is music being created today, and tomorrow, that can embody the spirit of the life and times in which we live. What's more, the music that Adams creates really connects with audiences even upon first hearing, I think. In fact, I know this from personal experience. Consider: about 10 years ago, I attended a New Hampshire Symphony Orchestra concert at the Palace Theatre in downtown Manchester, N.H.
At intermission, I strolled outside onto Hanover Street, where I encountered a young couple wandering aimlessly on a Saturday night. They asked me what was going on at the Palace, so I impulsively invited them in to check it out. They didn't have tickets, but not to worry: it was after intermission and there were plenty of empty seats where I was sitting in the balcony. (Alas, that's one reason the New Hampshire Symphony is no longer with us.) Just walk in with me like you belong, I said. They agreed. The fact that my new friends both sported multi-colored hair, ample facial piercings, and were dressed in leather from head to toe didn't seem to faze anyone as we walked past the ushers and made our way up to the balcony. The piece right after intermission was 'The Chairman Dances,' adapted by John Adams from his 1987 opera 'Nixon in China.' Conducted by Ken Kiesler, the music was mesmerizing right from the downbeat. Really! 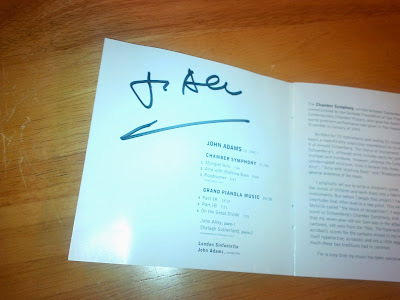 It had a presence that riveted the attention of everyone in that auditorium for the duration of the piece, all the way to the final petering out of the piano/percussion combo. 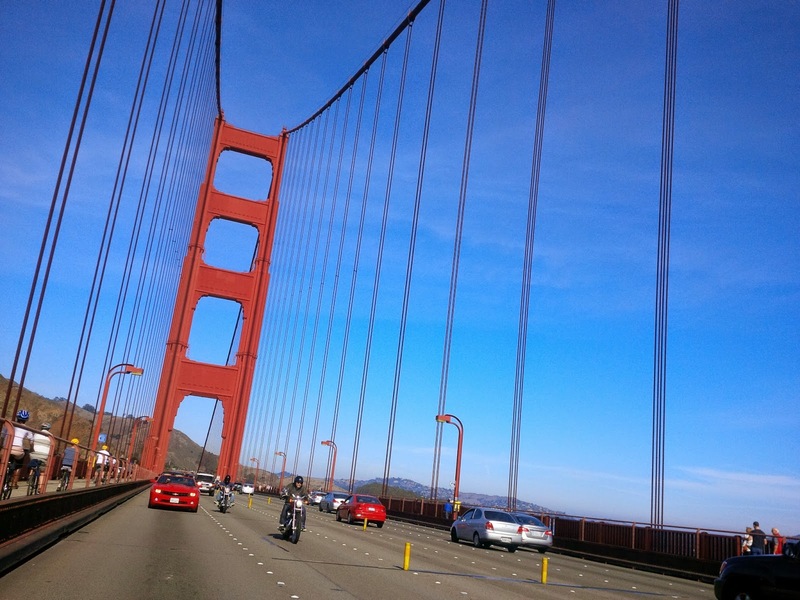 During the applause that followed, one of my new friends asked: "It is always like this?" Well, not always. But Kiesler and the NHSO followed the Adams with a performance of Respighi's 'The Pines of Rome' that, as David Letterman might have put it, blew the roof off the dump. Fast forward to now. For the past five years or so, I've been making so much of my own music in live performance that I've neglected exploring music of others. An omen? Time to start taking my own style and start committing it to paper? Well, could be. 'Klinghoffer' got me all excited about making music beyond the limits of my current improv-based silent film scoring. For instance: I still think an opera based on the Pam Smart saga could really be something. So we'll see. I'm reminded of that part of Vonnegut's 'Breakfast of Champions' where Kilgore Trout awakens to the possibilities of attending the arts festival in far-off Midland City, Ohio. As he mutters to his parakeet Bill: "There's work to be done." 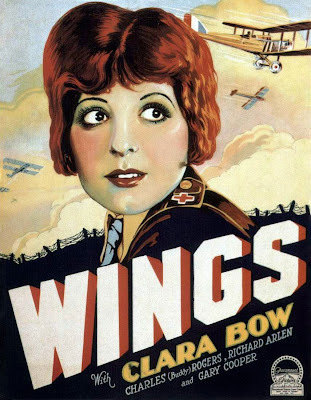 Clara Bow stars in 'Wings' (1927), to be shown with live music on Wednesday, Nov. 19 at 7 p.m. at Harvard University's Carpenter Center. Screening is free and open to the public. More info below! Yesterday's screening of Langdon's great comedy 'The Strong Man' in 35mm at the Somerville Theatre surprised me by drawing well over 100 people. Yes, it was a rainy day. But it was also Langdon, who's not exactly a household name, even among film buffs. In fact, his name has so little recognition that we actually promoted 'The Strong Man' as first picture helmed by a very young Frank Capra. And they came in numbers enough to make possible the kind of contagious laughter than sometimes happens with silent movies and large audiences. Here's how it works: Someone starts laughing, which starts other people laughing. And before you know it, you start laughing, too, helpless to resist joining in. Langdon atop his throne of beer barrels near the climax of 'The Strong Man' (1926). That's what happened on Sunday afternoon, making for one of the high points so far in the Somerville's ongoing series of screening silent films in 35mm and with live music. One of the great joys of this series is working with the Somerville's intense veteran projectionist, David Kornfeld. Those who attend the screenings know David from his colorful on-stage introductions prior to running up to the booth. But those of us on the "inside" also get regular and detailed reports of prints that pass through David's hands. These are always entertaining—especially when a print has been somehow mishandled in the past, or if David doesn't like a particular movie. If any of you is on the fence about coming to see The Strong Man today at 2.00, GET OFF THE FENCE & SEE THIS MOVIE. I just ran it for myself, and the film is nothing short of great (not a word I often use). Langdon movies NEVER SHOW -- EVER -- so this is a rare chance to see a rare, great, wonderful thing. And the print is TERRIFIC. I think it was struck in 1968, and it sure looks like it came off the camera negative -- or something so close to it I cant tell (which I sort of doubt) -- the detail & the image are fantastic. I cant praise this movie enough. I know this notice comes late in the day, but trust me & get your butts to the theatre!!!!!!! Geez, maybe that's why attendance was strong! Either way, I've found that working with dedicated fanatics such as David is one of the joys of the vintage film arena. 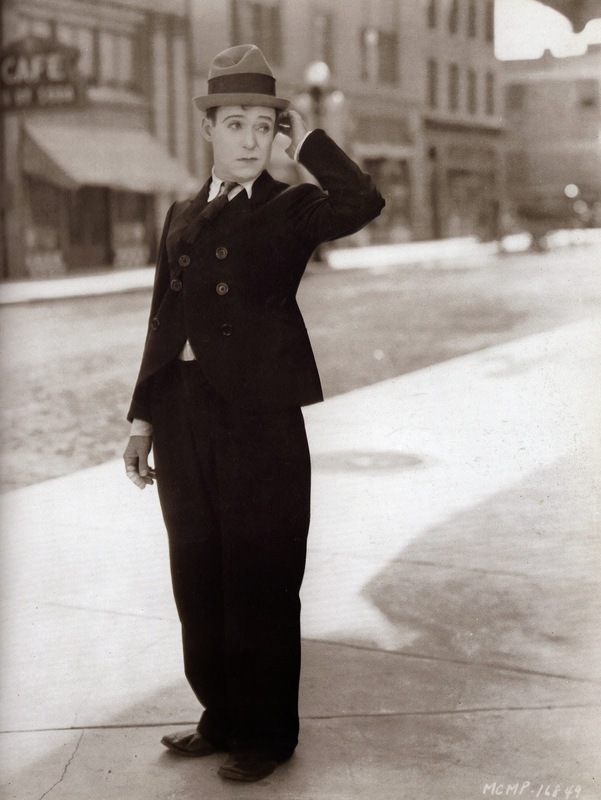 In his great book about the silent era, "The Parade's Gone By," author Kevin Brownlow pointed out that silent era personalities he interviewed almost without exception displayed an unmistakable spark of enthusiasm and sense of excitement about what they did and about life in general. I've found the same thing in many people who work with these films today. David's certainly one of them. And it's great that the Somerville has given him a place to practice his vanishing craft. Speaking of large audiences: I hope we have one for a screening of 'Wings' (1927) on Wednesday, Nov. 19 at 7 p.m. at the Carpenter Center at Harvard University. It's being run as part of a class, but it's open to the public and you can't beat the admission price: FREE! 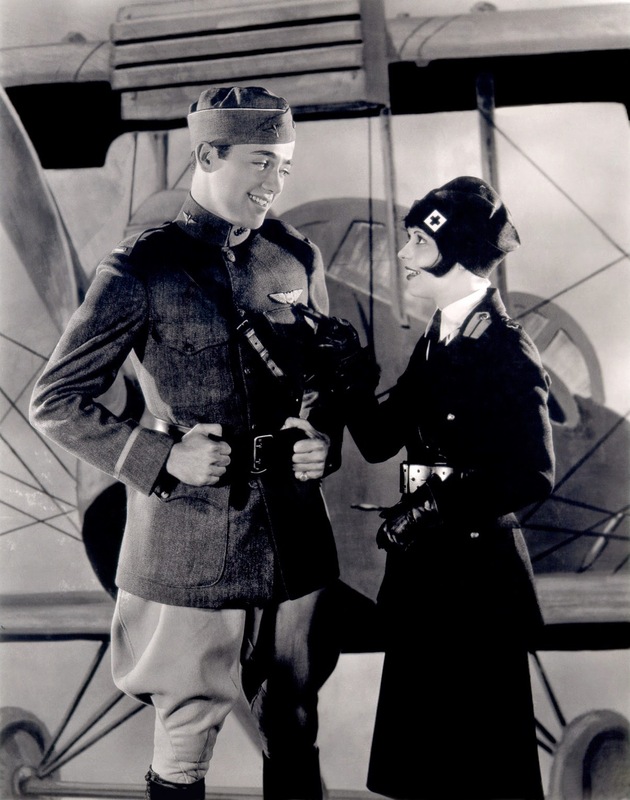 Buddy Rogers and Clara Bow (and a painting of an airplane) from 'Wings' (1927), to be shown this Wednesday at Harvard. 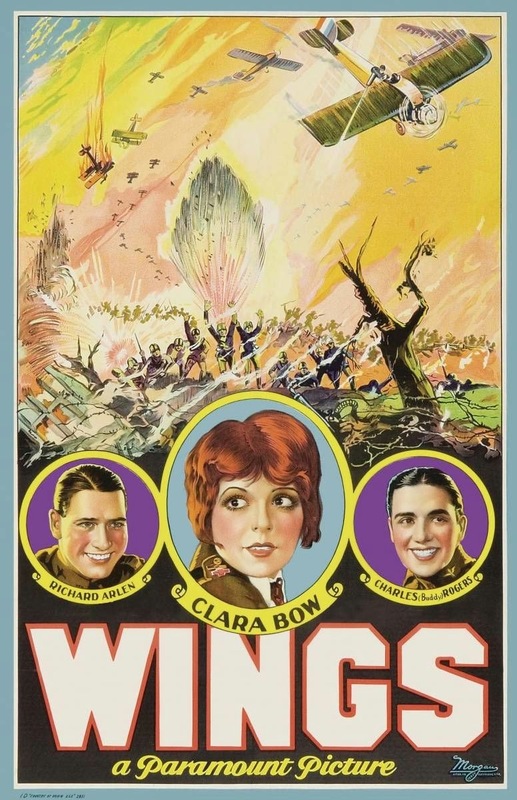 CAMBRIDGE, Mass.—Silent film with live music returns to the Harvard University's Carpenter Center with 'Wings' (1927), an epic adventure set in World War I that won 'Best Picture' honors at the very first Academy Awards ceremony. 'Wings' will be revived for one showing only on Wednesday, Nov. 19 at 7 p.m. The screening, which is free and open to the public, will allow audiences to experience silent film the way its makers originally intended: on the big screen, with live music, and with an audience. The screening of 'Wings' will feature live accompaniment by Jeff Rapsis, a New England-based composer who specializes in creating music for silent film presentations. Seen today, the film also allows contemporary audiences a window into the era of World War I, which began a century ago this year. The screening of 'Wings' is presented by the Visual and Environmental Studies at Harvard University and the Harvard Film Archive in connection with a course led by Harvard Prof. Tom Conley. 'Wings' will be screened on Wednesday, Nov. 19 at 7 p.m. at Harvard University's Carpenter Center for the Visual Arts, 24 Quincy St., Cambridge, Mass. The screening, presented by the Department of Environmental Studies and the Harvard Film Archive, is free and open to the public. For more information about the Harvard Film Archive, call (617) 495-4700 or visit hcl.harvard.edu/hfa/. For more about the music, visit www.jeffrapsis.com. An original poster for 'The Strong Man' (1926). This Sunday at the Somerville (Mass.) Theatre, we close out this year's monthly programs of silent film in 35mm with a doozy: 'The Strong Man' (1926) starring Harry Langdon. I've accompanied 'The Strong Man' several times, and it's grown into one of my all-time favorite silents. Yes, it's absolutely crammed with gags, and contains some of Langdon's all-time best routines. It really gives an audience a good time, even if they've never encountered Langdon before. But underneath the surface comedy is a richly textured film that resonates on several levels. This may have something to do with 'The Strong Man' being the first feature directed by a very young Frank Capra, which in itself is a reason to catch this Sunday afternoon's screening. As a warm-up, we're running 35mm prints of a pair of Keaton two-reelers: 'Cops' and 'One Week.' The show, set for Sunday, Nov. 16, starts at 2 p.m.
For more info, here's the text of a press release. Note how we deliberately played up the "Capra" connection, as his name is more recognized today, alas, than Harry Langdon's. That's show biz! SOMERVILLE, Mass. — Silent film with live music returns to the big screen at the Somerville Theatre this month with a showing of an uproarious comedy starring Harry Langdon. The screening, on Sunday, Nov. 16 at 2 p.m., will feature a 35mm print of Langdon's classic picture 'The Strong Man' (1926). 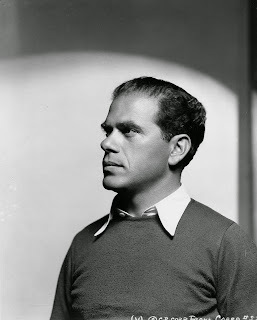 Helming 'The Strong Man' was young first-time director Frank Capra, who would later go on to create such Hollywood classics as 'Mr. Smith Goes to Washington' (1939) and 'It's a Wonderful Life' (1946). Live music will be provided by silent film accompanist Jeff Rapsis. Admission is $15 per person/ $12 for students and seniors. 'The Strong Man' tells the story of a World War I soldier (Langdon) who, following his discharge, finds work as assistant to a circus strong man. As the act travels the United States, Langdon continually searches for a girl he corresponded with while stationed overseas in the military. The search leads to a town controlled by Prohibition-era gangsters, which forces Harry to test the limits of his own inner strength even as he looks for his dream girl. Can Happy triumph over the bad guys? And is love more powerful than brute strength? The feature-length film showcases the unique child-like personality of Langdon, who is largely forgotten today. For a brief time in the 1920s, however, he rivaled Charlie Chaplin as Hollywood's top movie clown. 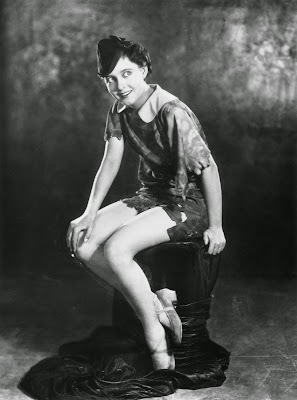 Langdon's popularity, which grew quickly in the last years of the silent era, fizzled as the movie business abruptly switched to talkies starting in 1929. 'The Strong Man,' a family-friendly comedy, was was selected in 2007 for preservation in the U.S. National Film Registry by the Library of Congress as being "culturally, historically, or aesthetically significant." In recent years, 'The Strong Man' has been recognized as a major achievement of the silent film era—a satisfying and timeless balance of emotion and comedy. "A little tragedy and a lot of laughs can be seen in 1926's The Strong Man," wrote critic Richard von Busack in 2007. "Director Frank Capra's energy and sturdy plot sense counterpoint Langdon's wonderful strangeness." 'The Strong Man' will be accompanied by live music by Jeff Rapsis, a New England-based silent film accompanist who performs at venues across the region and beyond. "These films were created to be shown on the big screen as a sort of communal experience," Rapsis said. "With an audience and live music, they still come to life in the way their makers intended them to. "So the Somerville's monthly silent film screenings are a great chance for people to experience films that first caused people to first fall in love with the movies," he said. The series also showcases the Somerville Theatre's continuing commitment to showing movies on actual film whenever possible. After more than a century of serving as the standard format for cinema, 35mm film has in recent years been replaced in most theaters by digital formats for first-run movies. While the Somerville has installed digital projection, the theater has also kept much of its 35mm projection equipment in place. This allows the Somerville to screen classic films in their native format, but also to show new titles in 35mm when filmmakers demand it. This allowed the Somerville to start showing the expected November blockbuster 'Interstellar' a few days earlier than most other venues, as director Christopher Nolan preferred theaters that could screen the movie in the traditional 35mm format. "We're very pleased with our decision to keep 35mm film projection in place," said Ian Judge, the Somerville's manager. "This allows us to show classic films, including the great silent pictures, as they were originally intended, but also lets us honor requests to use it for new releases as well." Frank Capra's 'The Strong Man' will be screened in 35mm and with live music on Sunday, Nov. 16 at 2 p.m. at the Somerville Theater, 55 Davis Square, Somerville, Mass. Admission $15 adults, $12 students/seniors. For more information, call (617) 625-5700 or visit http://www.somervilletheatreonline.com. For more info on the music, visit www.jeffrapsis.com. Plus, W.C. Fields as an abusive husband? 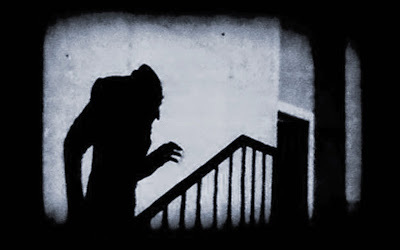 If the prospect of Christmas in six weeks isn't enough to terrify the bejesus out of you, then come see this evening's screening of 'Nosferatu' (1922). It's an encore presentation of the pioneer silent horror film, prompted by a sold-out screening prior to Halloween. We'll be running 'Nosferatu' tonight (Friday, Nov. 14) at 7 p.m. at Red River Theatres in Concord, N.H. Live music by yours truly. But first, a few words on last night's screening of 'Running Wild' (1927), a silent comedy starring W.C. Fields as a hen-pecked husband who undergoes a drastic change of personality following an encounter with a vaudeville hypnotist. This film, screened before a small but enthusiastic audience at the Flying Monkey Moviehouse and Performance Center in Plymouth, N.H., is a perfect example of a silent film not regarded as any kind of classic, but which really comes to life and holds up well when shown in the right environment. By that, I mean screened in a theater, with live music, and with an audience. Take any of those elements away, and you're likely to rob any silent film of much of its intended impact. That was certainly true with 'Running Wild.' All it takes is a few people laughing to prompt others to join in. And before you know it, you have that great silent comedy bonfire of laughter going. In terms of accompaniment, I've found an important element to keep the bonfire going is to not overplay the music. If it's too loud, an audience can't hear itself laughing, and so the spontaneous combustion never sets in. Once it does, however, you can grow the music with it. I'm especially excited by the audience reaction to 'Running Wild' because the transfer we used last night was from a 16mm print. So the visual quality was okay, but not pristine. Even so, that didn't seem to impede the audience response at all, which was generous throughout. We're running this same film at the Somerville Theatre next year, but using a 35mm print from the Library of Congress. So I have high hopes that the visual quality will be at a whole other level, which ought to really help this film go over even better. We'll see. It's part of a double bill of W.C. Fields silents on Sunday, March 8 at the Somerville, the other being 'Sally of the Sawdust' (1925). Either way, 'Running Wild' is also a great example of a film that's perhaps more interesting to us now that when it was first released. In this case, attitudes toward male and female roles have changed so much that what's presented as normal in a domestic comedy such as 'Running Wild' comes across as utterly astonishing to audiences today. In the world of 'Running Wild,' a businessman is supposed to be physically intimidating as a matter of course, and also be willing to resort to violence in a moment's notice. Just look at what it takes to collect a disputed bill! In the case of 'Running Wild,' as in so many other silent films, this alternate view of reality enriches the experience, I think. Not only does it add to the comedy, but it shows a viewer how different things were not that long ago. And that, to me, serves to underscore the idea that very few things in life remain fixed as we move from generation to generation. Change is constant—in attitudes, in fashion, technology, in the roles we play, in what's acceptable behavior, and so much more. Family man or abusive husband? Near the end of 'Running Wild,' look at the way Fields treats his wife and then his stepson. He physically intimidates both, wrecking the house in the process, and actually flogs the kid during an extended beating that doesn't stint on the violence. Wow! And this action is presented in support of Fields as a good husband and a man worthy of respect! After Fields manhandles and bullies his wife enough to cause her to faint, the first thing she says to him upon awakening is to tell him he's "so wonderful." Apparently no "anger management" classes at the local community college. However you feel about Fields' behavior, and even factoring in for comedy, it suggests that domestic violence wasn't just the norm, but it was expected and even necessary in a well-run household. Yes, there's some satire involved (he's 'Running Wild, after all), but underlying it all is a very different vision of what's acceptable under one's roof. Was it better? Can we learn something from seeing it depicted in a film like this, however exaggerated it might have been for comic effect? Have we lost anything in moving on from this vision? Interesting questions that make 'Running Wild' an interesting cultural artifact. But a few things don't change. Most of us still center our lives around family. Most of us struggle with balancing life's priorities. Most of us struggle with temptation, with moral dilemmas, with questions that have vexed humanity for centuries. Most of us, if we're truly alive, will experience the BIG emotions of life from time to time: Love, Hate, Joy, Anger, Despair, and so on. And as more years pass, even a mild domestic comedy such as 'Running Wild' can provide an increasingly clear window into what about life changes and what remains constant. What's ephemeral, and what's lasting. What will change, and what won't. Even as it still makes us laugh! Imagine that! Actor Max Schreck plays the title role in F. W. Murnau's 'Nosferatu' (1922). CONCORD, N.H.—If you missed out for Halloween, you have another chance to get frightened. 'Nosferatu' (1922), the first screen adaptation of Bram Stoker's novel 'Dracula,' will be screened with live music on Friday, Nov. 14 at 7 p.m. at Red River Theatres, 11 South Main St., Concord, N.H. The show has been scheduled as an encore presentation following a sold-out pre-Halloween screening at Red River. "Last month's screening of 'Nosferatu' proved popular enough to sell out," said Shelly Hudson, Red River's executive director. "So we scheduled this encore screening to provide another chance to see this great film presented with live music." It's an atmosphere that silent film accompanist Jeff Rapsis will try to enhance in improvising live music on the spot for the screening. 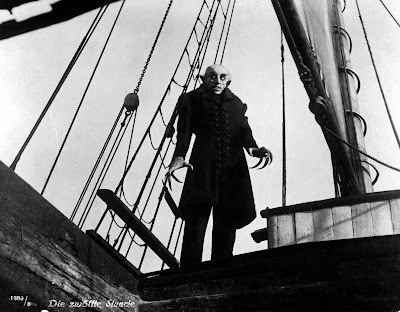 "The original 'Nosferatu' is a film that seems to get creepier as more time goes by," said Rapsis, a resident of Bedford, N.H. who ranks as one of the nation's leading silent film accompanists. An encore presentation of ‘Nosferatu’ will take place on Friday, Nov. 14 at 7 p.m. in the Jaclyn Simchik Screening Room at Red River Theatres, 11 South Main St., Concord, N.H. 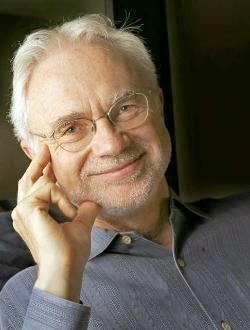 Admission is $10 per person; for more info, call (603) 224-4600 or visit www.redrivertheatres.org. For more information about the music, visit www.jeffrapsis.com. 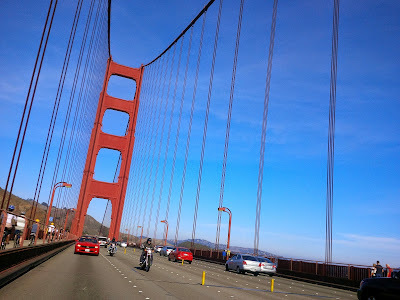 Besides playing for a silent film program, I also got to cross the Golden Gate Bridge sitting in the back of my brother-in-law's Camaro with the top down. I'm now back home after accompanying Mary Pickford in 'The Little American' (1917) this weekend at the Niles Essanay Silent Film Museum out in San Francisco, Calif. It's a vintage propaganda film that sure makes me want to join up and fight those dirty Jerrys, or, in the words of Albert Peterson, "whoever's dirty this time." In the small world department, 'The Little American' includes a good-sized role for New Hampshire native Walter Long, here playing a vile German officer. The folks at the Niles Essanay Museum are marking something of a milestone, by the way: their show on Saturday, Nov. 15 marks 500 consecutive weeks of silent film programs. 'The Little American' was a personal milestone for me, too: it was the 200th silent feature film for which I've accompanied. A list of them all is online here. Okay, coming up is a real treat for fans of vintage film comedy. On Thursday, Nov. 13, we're showing 'Running Wild' (1927), a domestic comedy starring the great W.C. Fields. Yes, it's hard to imagine Fields without his trademark nasal twang and vocal inflections. So when I accompany one of the Fields silent features, I like to tell people they're about to experience W.C. Fields "as you've never heard him before." If you could use a laugh, I encourage you to join us this Thursday at 6:30 p.m. at the Flying Monkey in Plymouth, N.H.
All the Fields silents seem to hold up well in live performance—perhaps in part because many of us already know the character. See (but don't hear) for yourself at this week's screening of 'Running Wild.' Details in the press release below. W.C. Fields (with mustache) at about the time 'Running Wild' (1927) was filmed. PLYMOUTH, N.H.—He was a performer who could be recognized just by the sound of his voice. 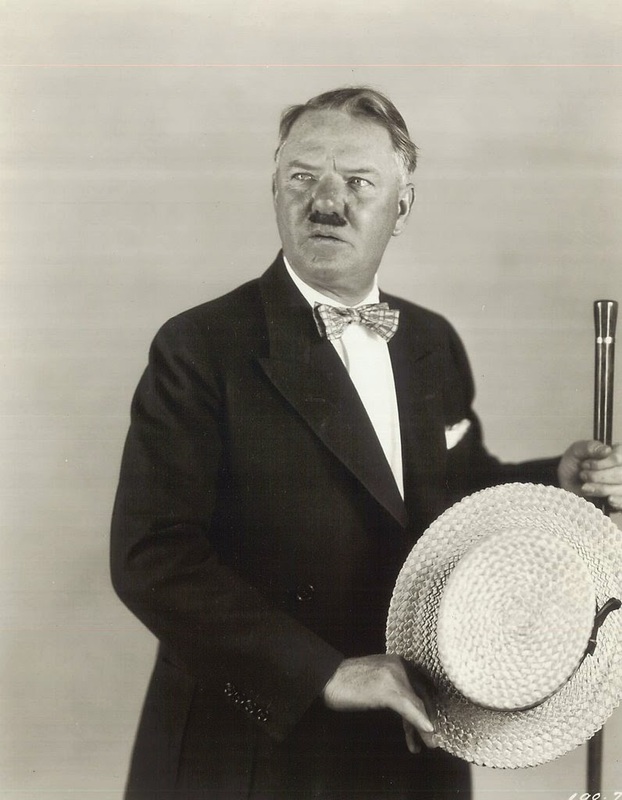 But prior to reaching iconic fame in talking pictures, comedian W.C. Fields starred successfully in a popular series of silent feature films for Paramount Pictures and other studios in the 1920s. See the non-talking W.C. Fields for yourself in 'Running Wild' (1927), one of Fields' most highly regarded silent pictures, in a screening on Thursday, Nov. 13 at 6:30 p.m. at the Flying Monkey, 39 South Main St., Plymouth, N.H. General admission is $10 per person. Live music will be provided by silent film accompanist Jeff Rapsis, a resident of Bedford, N.H. and one of the nation's leading silent film musicians. W.C. Fields remains famous for his comic persona as a misanthropic and hard-drinking egotist who remained a sympathetic character despite his snarling contempt for dogs, children and women. Although Fields achieved lasting fame as a movie star in talking pictures of the 1930s, his long career encompassed decades on the vaudeville stage as well as a series of silent film roles. "People find it hard to think of W.C. Fields in silent films, but he was actually quite successful in them," Rapsis said. "As a vaudeville performer and juggler, Fields cultivated a form of visual comedy and pantomime that transferred well to the silent screen. Also, as a middle-aged man, he was able to play a family father figure—the kind of role that wasn't open to younger comic stars such as Charlie Chaplin or Buster Keaton. In all, Fields starred in 10 silent features in the mid-1920s. Several of these films are lost; in those that survive, Fields sports a thick mustache, part of his vaudeville costume as a "vagabond juggler" which he dropped in later years. In 'Running Wild,' Fields plays Elmer Finch, a cowardly and henpecked husband who is disrespected by his stepson, his co-workers, and even the family dog. The result is a timeless domestic farce that continues to delight audiences when screened as intended: in a theater, with live music and an audience. Upcoming movies include a love story starring silent screen romantic idol Gloria Swanson, and early Tarzan film, a classic Buster Keaton comedy, and an adaptation of 'The Count of Monte Cristo' that was thought lost for decades. • Thursday, Feb. 12, 2015, 6:30 p.m.: 'Don't Change Your Husband' (1919) starring Gloria Swanson, directed by Cecil B. DeMille. Just in time for Valentine's Day! A riotously dated look at marriage through the eyes of a woman who is bored with her oafish onion-eating husband and decides to take action. The next installment in the Flying Monkey's silent film series will be 'Running Wild' (1927), to be screened with live music by Jeff Rapsis on Thursday, Nov. 13 at 6:30 p.m. at the Flying Monkey Moviehouse and Performance Center, 39 South Main St., Plymouth, N.H. Tickets are $10 per person. For more information, call (603) 536-2551 or visit www.flyingmonkeynh.com. For more information about the music, visit www.jeffrapsis.com. The good news: I survived my "three films in one day" marathon on Sunday, Nov. 2. But the bad news is that I haven't had time to catch my breath since. And then on Thursday, Nov. 6, I catch a plane to San Francisco, where I'll do music for a program highlighted by Mary Pickford's 'The Little American' (1917). So here's a quick report on recent film screenings and a look at what's coming up. Betty Bronson as Peter Pan, who landed at the Bedford (N.H.) Public Library on Sunday, Nov. 2. 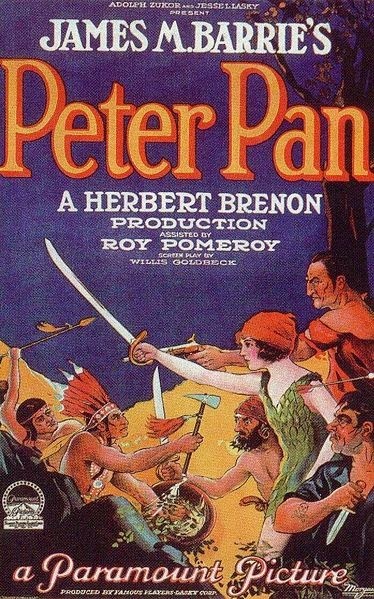 • Sunday, Nov. 2: 'Peter Pan' (1924) at the Bedford (N.H.) Public Library. Fun to do a silent film screening right in your own hometown. I was introduced by Paul Bordeleau, a local legend who's performed for decades and taught generations of students. I don't know how old Paul is, but I do know he's a D-Day veteran, so he must be at least in his mid-80s. But he's sharp as a tack and still spry enough to carry audio equipment out to my car. He drives everywhere. Age doesn't seem to have slowed him up at all. It's only a guess, but Paul's involvement in music must be a factor in how active he continues to be. That's a good reason to keep doing silent film accompaniment—to forestall my own descent into decrepitude. About the film: the audience for this "family friendly" screening was a little short on actual children. But those that attended did a stellar job in the audience participation part of the program, where Peter begs the audience to save Tinkerbell by clapping. Tinkerbell made it, so gold stars for everyone! And I've often wondered: Did the filmmakers prepare an alternate version of this scene in which a lack of audience response causes our favorite fairy to bite the fairydust? Tinkerbell doesn't have much to do after this scene, so it wouldn't have really hurt the film. Would have made things just a little more interesting. • Sunday, Nov. 2: 'Four Around A Woman' (1921) and 'The Wandering Image' (1920), both directed by Fritz Lang, at the Harvard Film Archive. A double bill of very obscure early Lang efforts, both shown in 35mm prints, illustrated the pitfalls of preparation. First up was 'Four Around A Woman,' a title that I'd previewed only once, and found it didn't make a lot of sense to. Because I wasn't too inspired, I didn't spend a lot of time developing original material. 'The Wandering Image' followed. 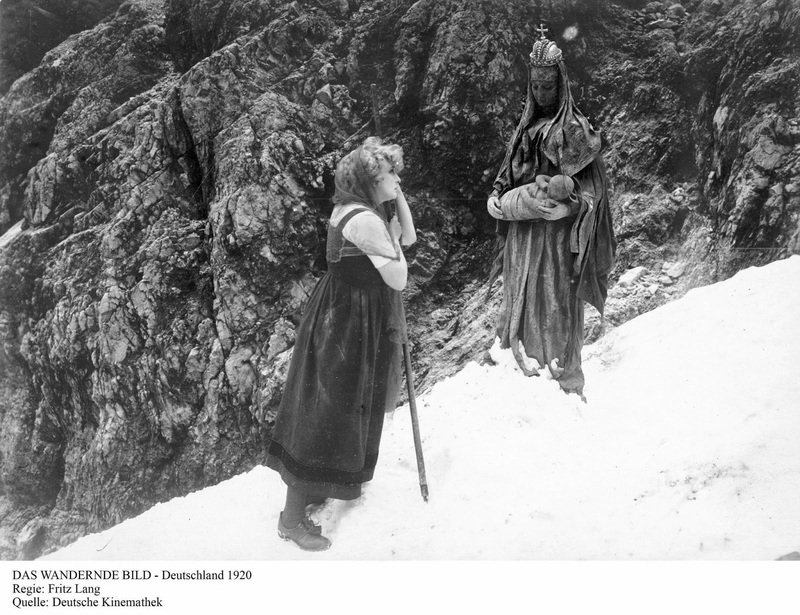 With extensive Bavarian Alps location shooting (a rarity for Lang), I responded much more readily to this flick. So, to go along with the expansive landscapes, I plotted out an ambitious soundscape for the picture, making simultaneous use of my digital synthesizer and the hall's Yamaha grand piano. So come screening time, guess which score went well, and which was a mess? Of course the completely unplanned 'Woman' music fell together perfectly, while the 'Image' score was an avalanche of weak moments and missed opportunities that never quite jelled. Maybe there's a lesson in that. But the first film, 'Four Around A Woman,' surprised me in that when seen on the big screen and with an audience, it seemed to make perfect sense! Musical themes for characters and situations came easily, and it all built nicely to a melodramatic climax. With 'The Wandering Image,' it was more like 'The Wandering Accompanist,' as nothing I did seemed to work very effectively with what was happening on screen. And I kept botching the notes when I reached over to get the big bass drum/cymbal sound for lightning strikes, etc. Part of this might be the result of 'Wandering Image' being my third film of the day, and I'm perfectly willing to admit that at some point an accompanist is going to run out of gas. I might just been tired. But I also take it as yet another example of how just showing up and going with it seems to be a pretty good strategy for my style of playing. Call it the "Woody Allen School of Accompaniment" after his observation that 90 percent of life is showing up. 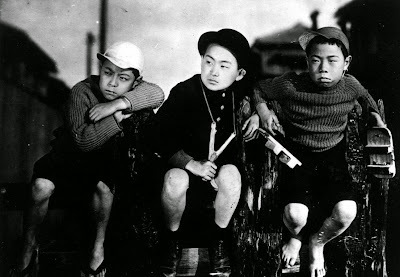 Not quite Our Gang: A scene from 'I Was Born, But...' (1932), a silent from Japanese director Yasujiro Ozu. • Tuesday, Nov. 4: Two days later, it was back to Harvard to accompany an afternoon screening of 'I Was Born, But...' (1932), a film from Japanese director Yasojiro Ozu. I'd never encountered Ozu's work before this: a delicately observed portrait of two young brothers who discover that their father is not "someone important," but a company salaryman. It's not all comedy, but the tone is light enough to justify a score that was very different from what I usually do. Using a few simple melodies and a synthesizer setting that blended woodwinds and the sound of a plucked harp, which I think evoked a kind of child-like wonder throughout the film. Also I avoided the clichéd sound of fifths played on a pentatonic scale, which I've sometimes heard referred to as "chopsticks" music. Tong War, anyone? Instead, I built the score using a modal scale that incorporated a sharped 4th and a flatted 7th, which sounded vaguely Asian, and also worked in a lot of bright harmonies: chords with several notes of the scale close together all at once. I was really pleased with how it came out. No big musical gestures, just a modest running accompaniment that I hope evoked the world Ozu was trying to depict. The course is taught by Prof. Adam Hart, who afterwards said he thought the music for "I Was Born, But..." was the best of what I did for his class. Thank you, Adam! I completely agree! Me banging the hell out of my Korg synthesizer back in 2010. • Technical issues: One nice thing about the recent Harvard screenings is that I'm now able to plug my synth output directly into the theater's sound system. It really sounded great, so one less opportunity to stress out my aging speaker/amps. However, this past weekend I did acquire a second Korg keyboard as a back-up for my 13-year-old machine, which is literally falling apart. It's the exact same model as mine: a Korg Triton LE with the full 88 keys. But it's much newer and much cleaner , as it has been an indoor Korg. I got it from a nice guy in Westerly, R.I. who was selling it on Craigslist. When I fit saw it, it was like my old bang-ed up machine had discovered the synthesizer fountain of youth! It was reborn! Haven't had a chance to really play with it. But as soon as I can check it out thoroughly, the trusty old Korg will be relegated to back-up status, and the new Korg will start being hauled around to venues hither and yon. I'll eventually get around to deciding on a totally new synth: probably some kind of Kurzweil. But I haven't been satisfied with the keyboard feel of what I've tried out so far, so we'll see. In the meantime, I at least have a back-up if one or the other of my fleet of aging synthesizers finally shits the bed, if you'll forgive me using a technical term. The next piece of equipment I really need are new speakers for venues that do not have adequate house sound systems. The two old Rolands I drag around have been great, but they're literally falling apart, and in some ways they're clearly not reliably handling the full output of the synth. But as with the keyboard, I've yet to find anything quite like my Rolands, which I understand are not made anymore. It's just like what happens to me with shoes: as soon as I find a style I like, they get discontinued! Anyone know any speakers for sale? 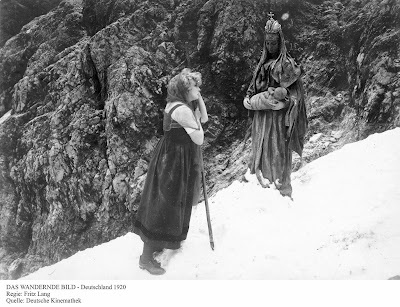 A scene from the very obscure early Fritz Lang film 'The Wandering Image' (1920), being shown today (Sunday, Nov. 2) at 7 p.m. at the Harvard Film Archive. Just a brief update to fling us into November. 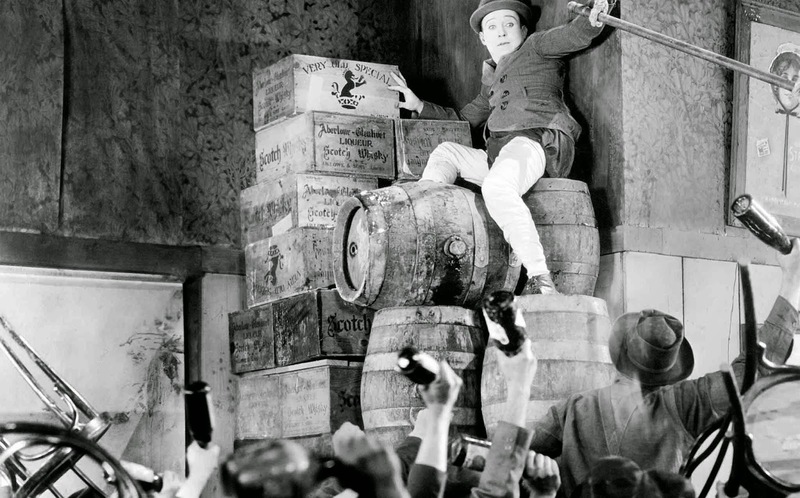 Halloween may be over, but there's no let-up in the silent film calendar just yet. On this very day (Sunday, Nov. 2), I'm booked to accompany three separate feature films. Hey, this is getting serious! 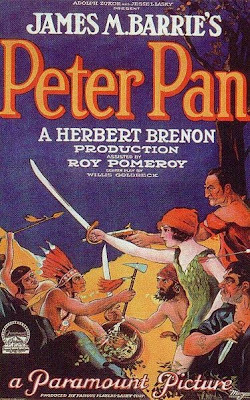 Long before Peter Pan was slated for a live TV production (next month on NBC), it was a silent film! • First up: at 2:30 p.m., a screening of the silent film version of 'Peter Pan' (1924) at my hometown library in Bedford, N.H. The library runs a monthly musical performance series, and once in a great while I get to do music for a silent film screening there. Our screening of 'Peter Pan' is free and open to all, with room for about 100 people. Let's fill the house! The show takes place in the lower level of the Bedford (N.H.) Public Library, 3 Meetinghouse Road, Bedford. Carola Toelle enjoys a rare quiet moment in Fritz Lang's 'Four Around a Woman' (1921). • Following 'Peter Pan,' I scoot down to Cambridge, Mass., where the Harvard Film Archive has me accompanying two very obscure early Fritz Lang features in a program that starts at 7 p.m. The two films are 'The Wandering Image' (1920) and 'Four Around a Woman' (1921), both thought lost until partial prints were discovered in Brazil in the 1980s. The prints were so difficult to get, the titles couldn't be included in the HFA's recent summer-long Lang retrospective. So it's catch-up night as these two rarely screened films finally hit the big screen to complete the cycle, as they say. I have no idea what shape the 35mm prints will be in, as the materials don't survive in pristine shape and much of the circulating footage still has untranslated Portuguese intertitles. So it could range from great to a real tough go. (The HFA Web site promises German intertitles with English subtitles.) Either way, I'll give it my best shot. Of the two, I think 'Wandering Image' really surprises, in part because so much of it is shot outdoors and on location: something Lang didn't do much of later on. Also, a lot of the action takes place above treeline high in the Bavarian Alps, amidst snowfields and craggy peaks. So even if all the threads of Lang's plot can't quite be decoded, there's a lot to look at in these films. Hope to see you there! For more info on the early Lang titles, check out the Harvard Film Archive online. The screenings take place in the Carpenter Center, 24 Quincy St., Cambridge, Mass. (It's just outside the Harvard campus proper.) Admission is $9 per person. • After this, it's another screening at Harvard on Tuesday, Nov. 4 and then it's off to San Francisco, where I'll play for Mary Pickford's 'The Little American' (1917) next weekend at the Niles Essanay Silent Film Museum.